Springshare’s Libguides have become an integral part of our work as librarians, and although we’ve all come to accept certain best practices in their creation, there’s still the matter of making well-presented information look good. Miyo Sandlin, Digital Services and Instruction Librarian at St. Francis College, recently revamped the library’s APA Style research guide with an eye towards usability, aesthetics, and style. Penn State University has created an game-changing resource for educators and students interested in creating high-quality videos: One Button Studio. This studio room + tech app set-up has been replicated at several colleges, universities, and libraries, including the University of Notre Dame’s Hesburgh Library. Today’s post features One Button Studio instructional handouts/flyers by Randal Sean Harrison, Emerging Technologies Librarian at the Hesburgh Library. Created using Adobe Illustrator, Randal’s flyer design and accompanying LibGuide are extremely helpful to libraries and institutions building or contemplating a One Button Studio installation. We are, without a doubt, a Springshare library. Libguides? Check! Libanswers? Yes! Libchat? Yup! LibCal? You bet! Although we’ve embraced Libguides as a platform for creating subject (and not-so-subject-based) guides, we hadn’t really been using Libguides in a way that many librarians currently do: as the main access point to the library’s online database collection. Instead we were using ResearchPort, a gateway maintained by the University of Maryland Libraries ITD center. We wanted to have more control over our database access point interface, so we decided to go with a Libguide. 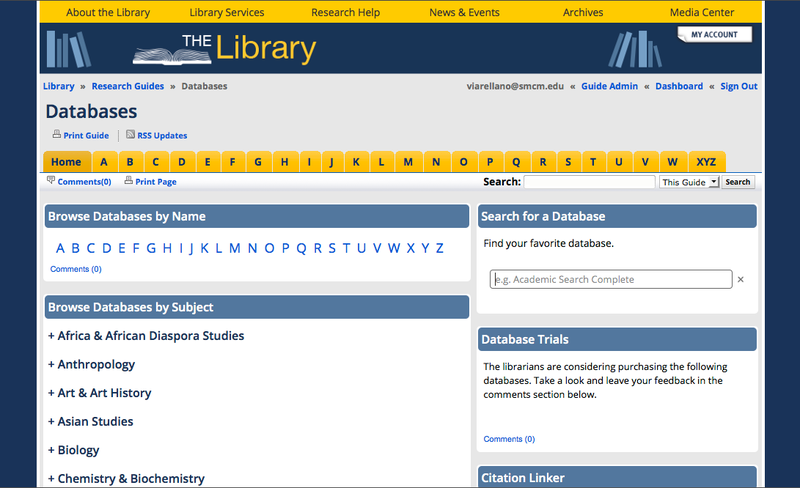 Here’s what I came up with: Databases Libguide (see screenshots below). It has the same look and feel as our library site and our other libguides, but has some cool features I’m really proud of creating and adapting. The technical support at Springshare is amazing. I knew that I wanted to avoid creating separate pages/tabs for each of our subject categories, but I didn’t know enough about scripting to create collapsible menus. Enter Cindi Trainor at Springshare, who set up a great collapsible box feature for me to use. All that was left for me to do was style each of the subject boxes that that they smooshed together (yes, that’s a technical term) and looked like one giant box. Fooled you, didn’t I?I think this is a nice way to get a lot of useful content on the page without taking up a ton of room. Bonus: Our subject librarians can reuse these database boxes on their own subject guides! 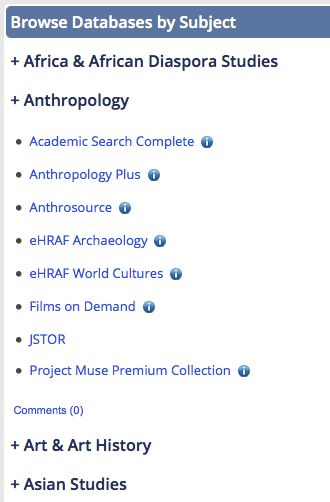 This is an adaptation of the search created by Scott Salzman at Furman University Libraries. He recently presented this amazing solution at the 2013 Springy Camp, thereby and was kind enough to offer his code and support. 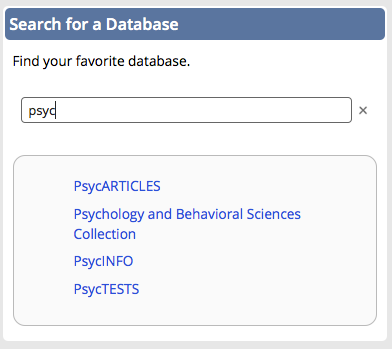 You can learn more about this search box in the Libguide Scott created for his presentation. 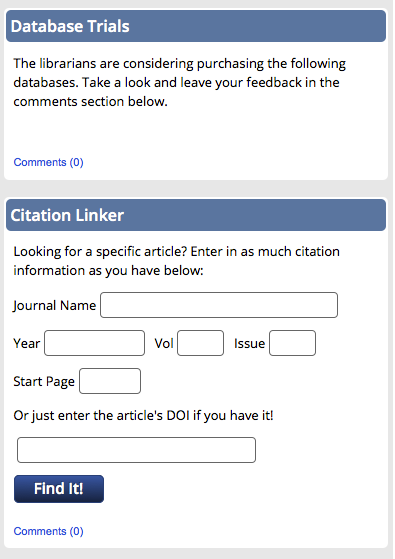 It’s a great alternative to using the “search this guide” feature embedded in Libguides, which will only give you the name (aka the letter) of the page in which the database link appears. If you have questions about the creation of this guide, email Veronica Arellano Douglas.